Back in 2017 we created a list of 90 active blogs across Analytics, Big Data, Data Mining, Data Science and Machine Learning. Two years on and we’ve decided to update that list, pushing the number up to 100 and giving you more choice than ever to be able to read more on topics that interest you. This year, we’ve removed 24 blog sites from the previous list that no longer met our active criterion: at least one blog post in the last three months (since October 1st, 2018). We’ve also added 36 new relevant blogs to the selection. As before, all blogs in this list are categorized into two groups: very active and moderately active. The former often have several entries each month while the latter may only have one post for a few months recently. We also separate blogs that do not involve much in technical discussions as in an Others group. Within each group of blogs, we list in alphabetical order. The blog overview is based on information as it has appeared on its URL as of 6th January 2019. If we have missed any popular active blogs, please suggest them in the comments below. Enjoy! Amazon AI Blog, Amazon's official AWS AI blog. Analytixon, advanced Analytics & R.
Berkeley AI Research, Berkeley university blog. Big on Data, by Andrew Brust, Tony Baer and George Anadiotis cover Big Data technologies including Hadoop, NoSQL, Data Warehousing, BI and Predictive Analytics. Data Double Confirm, by Hui Xiang Chua, the blog documents her learning journey and doubles up as a starter kit for those interested to learn more about data science. Data Genetics, by Nick Berry. Data Science 101, by Ryan Swanstrom, blog about learning to be a data scientist. Data Tau, a list of interesting articles submitted by readers. Data36, blog about data analysis, AB-testing, research, big data and more. Dataiku, blog of Dataiku, the company that brings data analysts, engineers and scientists together. Data-mining.philippe-fournier-viger, a blog by Philippe Fournier-Viger about data mining, data science, big data. Dataquest blog, data science, data analysis, and data engineering tutorials and articles. DecisionStats, by Ajay Ohri, founder of DECISIONSTATS and author of “R for Business Analytics” and “R for Cloud Computing”. Domino Data Lab, on startups, data science, R and Python. EMC Big data blog, the big data blog of Dell EMC. Error Statistics Philosophy, by Virginia Tech statistical philosopher Deborah G. Mayo. Forrester Big Data Blog, an aggregation of blogs from company contributors focusing on Big Data topics. business data. Freakonometrics, hypotheses – Charpentier, a professor of mathematics, offers a nice mix of generally accessible and more challenging posts on statistics related subjects, all with a good sense of humor. Google Analytics products, a Google blog with news & tips on Google Analytics, Data Studio, Optimize, Surveys, and Tag Manager. HPE Vertica Developer Community Blog, a blog by Micro Focus. Hyndsight, by Rob Hyndman, on fore­cast­ing, data visu­al­iza­tion and func­tional data. Insight Data Science, blog on latest trends and topics in data science by Alumnus of Insight Data Science Fellows Program. Your bridge to careers in Data Science and Data Engineering. JT on EDM, by James Taylor on Everything Decision Management. Juice Analytics, a blog on analytics and visualization. Kaggle blog “No Free Hunch”, covering Kaggle data science and machine learning competitions The Official Blog of Kaggle.com. Lazy Programmer, on the latest in big data, data science, and coding for startups. Machine Learning Mastery, by Jason Brownlee, on programming & machine learning. Mine That Data, by Kevin Hillstrom, views on Multichannel Marketing and Database Marketing. MLWhiz, by a data scientist consultant and big data engineer based in Bangalore, currently working at WalmartLabs. Numbers rule your world, by Kaiser Fung big data plainly spoken. Observational Epidemiology, a college professor and a statistical consultant offer their comments, observations and thoughts on applied statistics, higher education and epidemiology. Overcoming bias, by Robin Hanson and Eliezer Yudkowsky. Present Statistical analysis in reflections on honesty, signaling, disagreement, forecasting and the far future. Predictive Analytics World, blog, by Eric Siegel, founder of Predictive Analytics World and Text Analytics World, and Executive Editor of the Predictive Analytics Times, makes the how and why of predictive analytics understandable and captivating. Revolution Analytics, news about using open source R for big data analysis, predictive modeling, data science, and visualization. Rick Sherman: The Data Doghouse, on business and technology of performance management, business intelligence and data warehousing. Sabermetric Research, by Phil Burnbaum blogs about statistics in baseball, the stock market, sports predictors and a variety of subjects. SAS Voices, SAS experts blog about advanced analytics and compelling industry insights. Sicara, on analytics and Visualization in Big Data. Simply Statistics, by three bio-statistics professors (Jeff Leek, Roger Peng, and Rafa Irizarry) who are fired up about the new era where data are abundant, and statisticians are scientists. Statistical Modeling, Causal Inference, and Social Science, by Andrew Gelman. Steve Miller BI, blog at information management. The Analysis Factor, by Karen Grace Martin. The John D. Cook blog, about statistics, analyzing data, problem solving and integrating solution components. Tom H. C. Anderson personal blog, focusing on market research with data and text mining. Towards Data Science, sharing concepts, ideas and codes. Vincent Granville blog, Vincent, the founder of AnalyticBridge and Data Science Central, regularly posts interesting topics on Data Science and Data Mining. Xi’ans Og Blog, by a professor of Statistics at Université Paris Dauphine, mainly centered on computational and Bayesian topics. Active Wizards, blog by data science and engineering company Active Wizards. Adventures in Data Land, by Alex Smola. Auduno, by Audun M. Oygard, a data scientist with a background in statistics and fine art. Blog About Stats, by Armin Grossenbacher, a network for professionals mainly of statistical institutions. Statistics. Technology, by Galit Shmueli, Professor of Statistics at Indian School of Business, Hyderabad, India. Erik Bernhardsson, blog about analytics from the head of Engineers of mortarge company Better. Erogol, a Blog from a Human-engineer-being. net, by John Langford, a leading applied machine learning researcher, covers the intersection of machine learning theory and practice. InnoArchiTech, by Alex Castrounis, covering topics including artificial intelligence, machine learning, data science, big data, and IoT, with a focus on concepts, techniques, best practices, and trends. Jonathan Manton's blog, tutorial-style articles in the general areas of mathematics, electrical engineering and neuroscience. Lab41, findings, results and thoughts on data analytics research. Love Stats Blog, by Annie, a market research methodologist who blogs about sampling, surveys, statistics, charts, and more. Nuit Blanche, by Igor Carron, focuses on Compressive Sensing, Advanced Matrix Factorization Techniques, Machine Learning. Perpetual Enigma, by Prateek Joshi, a computer vision enthusiast writes question-style compelling story reads on machine learning. Probability & Statistics Blog, by Matt Asher, statistics grad student at the University of Toronto. Check out Asher Statistics Manifesto. Stats with Cats, by Charlie Kufs who was crunching numbers for over thirty years. StreamHacker, by Jacob Perkins, author of Python 3 Text Processing with NLTK 3 Cookbook. Three Toed Sloth, a blog written by Professor Cosma Shalizi who teaches statistics at Carnegie Mellon University. Walking Randomly, by Mike Croucher. Will do stuff for stuff, by data scientist Jose Maria Mateos Perez. Will wolf, data science things and thoughts on the world. Will's Noise, blog covering data science and technology, in particular Python, flask, scikit-learn or cycling. Win-Vector Blog, by John Mount and Nina Zumel, with opinion pieces and technical writing. Analytics Vidhya, on development of analytical skills, analytic industry best practices, and more. 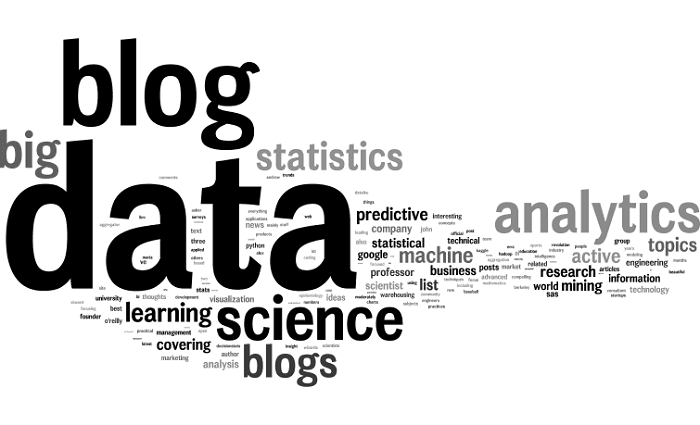 Data Science Blogs, a curated list of data science blogs. KDnuggets, a leading site/blog on Big Data, Data Science, Data Mining, Predictive Analytics (this site, included for completeness). O'Reilly Ideas, formerly "O'Reilly Radar", a wide range of research tops and books. Planet Big Data, is an aggregator of blogs about big data, Hadoop, and related topics. We include posts by bloggers worldwide. R-bloggers, best blogs from the rich community of R, with code, examples, and visualizations. SAS Blogs home, connecting to people, products, and ideas from SAS. Smart Data Collective, an aggregation of blogs from many interesting data science people. The Data Warehouse Insider, technical details, ideas and news on data warehousing and big data from the Oracle Team. Beyond the Box Score, a blog using statistics to analyse the game of baseball. Calculated Risk, on Finance and Economics. Unofficial Google Analytics, blog from ROI Revolution.